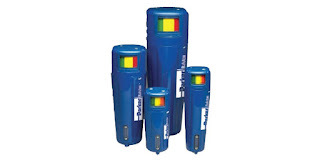 Coalescing filters for industrial compressed air service. Image courtesy Parker Hannafin - Balston Div. Coalescing filters remove liquid aerosols from a gas by causing very small droplets to contact others, forming successively larger liquid droplets that eventually are moved via gravity to a drain. A combination of filter media and housing properly direct an inlet stream to maximize the combining, or coalescing, of the fine droplets. The filter media will also serve to trap solid particulates, as well. An automatic drain arrangement is a useful feature that prevents accumulation of liquid in the filter housing without operator attention. Compressed air systems will typically produce output that contains moisture and small amounts of liquid lubrication oil. Leaving the compressor, the air is hot. As it cools, the moisture will condense in the piping system and utilization equipment without a means to remove it. Coalescing filters, properly located throughout the system, will trap and remove liquids entrained in the compressed air stream. The nature of the filter media also results in efficient capture of solid contaminants, such as rust, dust, welding flash and more. The installation must route the compressed air through the filter in the proper direction. Improperly piped units can have their automatic drain function inhibited, leading to failure and a need to reconnect the unit correctly. Size selection is simplified with tables providing maximum flow rate for rated filtration performance. Oversizing a selection will not produce a negative impact. The filter media pressure drop increases as solids are collected and retained, requiring replacement when pressure drop is excessive. Share your compressed air system requirements and challenges with filtration specialists. Leverage your own knowledge and experience with their product application expertise to develop an effective solution. Compressed Coalescing Filters for Industrial Use from Classic Controls, Inc.